After much delay, Terra Nova finally premiered earlier this fall on FOX. Reasons for the delay were reportedly due to production problems such as tweaking the special effects. Despite Steven Spielberg being behind the show, a lot of people fretted over the delays especially when Brannon Braga (who many blame for Star Trek’s decline) came onboard as a show runner. What most overlook is that other sci-fi TV veterans are also involved like Firefly’s Jose Molina and Trek writer/producer Rene Echevarria. With all these talents behind the scenes you have to wonder why Terra Nova isn’t a can’t-miss show. Many parts of it come off as tepid combinations of seaQuest and tired Star Trek plots (and that means the banal Next Generation and Voyager episodes that earned Braga his reputation). Yet there is potential in this program. It’s not downright awful and I’m still watching (which is something that could not be said for other new genre offerings like Person of Interest and Once Upon A Time, I couldn’t even get past the half hour mark on those pilots). Here’s the premise as seen in the pilot episode “Genesis;” by 2149 Earth is an ecological disaster, overpopulated, polluted and pretty grim. But humanity’s salvation lies in the distant past. A way was found to time travel back 85 million years into an alternate Earth (and sidestepping any time paradox questions), so a select few are chosen whether by lottery or needed skill to go back in time and live in a new colony called Terra Nova. Enter the Shannon family. In the future, family sizes are regulated to just two children and the Shannons are caught harboring a third child, which leads to the father Jim (played by Jason O’Mara) to being jailed. Years later, the rest of the family is chosen to make a pilgrimage to Terra Nova. His wife Elizabeth (played by Shelly Conn) helps break Jim out of jail and all five of them escape into the past to start over. Probably part of the problem with the show is that the place they arrive in is a bit too perfect. It tries to come off as a bit rugged but the colony looks like a beefed up farmer’s market meshed with a timeshare resort with everyone walking around casually. The Shannons are part of the what’s called the Tenth Pilgrimage, meaning that nine other waves of colonists have arrived and settled into the place. It would have been more interesting to have seen the struggles of the early colonists, seeing death, hardships, and dinosaurs. Yep. 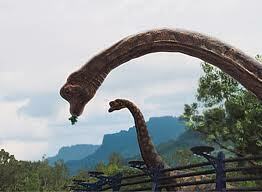 For a show that takes place in prehistoric times, dinosaurs appear far and few in this show, which is surprising when you consider that each episode costs about $4 million and has a longer than usual post production. If you look at Primeval, which has plenty of scenes with dinosaurs per show, you have to wonder where did Terra Nova’s budget go to? Sure, it has some nice special fx, esp. when showing futuristic tablets and graphics but the dinosaurs are nowhere near the level seen in the Jurassic Park films. They might as well have set the show during a more recent time period, the premise would still be viable. So without the constant drudgery of trying to set up a colony, the show is reduced to banal plot lines. One episode called “The Runaway” dealt with a little girl that sought asylum with Terra Nova. She was part of a group of renegade, thuggish colonists that broke away from the colony in the Sixth Pilgrimage and are known as the Sixers. Interesting concept for recurring villains, but they come off as rejects from a bad Mad Max rip-off with Hollywood camouflage face painting and rags. It was pretty obvious that the girl was a plant sent by the Sixers to infiltrate the colony. 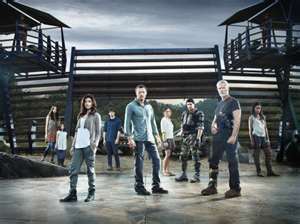 But the episode did reveal some mysteries such as the fact that some people from the future are unhappy with the leader of Terra Nova (Commander Nathaniel Taylor, well played by Stephen Lang, think of a nicer version of the character he portrayed in Avatar) and want him removed and part of the mission of the Sixers is to do this. There are very small indications that there is more to Terra Nova than viewers are shown such as the story behind Taylor’s missing, estranged son. But so little time is spent on them. Instead we get generic plot lines and really stupid family and teenage drama that belongs on The CW network. Haven’t the producers seen other genre shows with idiotic teenagers and known how loathed the y were? Here we have Jim’s mopey son Josh (Landon Liboiron) wasting screen time about how miserable he is without his girlfriend from the future. So he takes a job with a shady bar owner, that the parents are completely unaware of until lately (even from the first episode it was shown the parents were irresponsible by not keeping tabs on him), and strikes up a bargain with the leader of the Sixers to bring his sweetie pie through the time portal. How dumb is this guy? Then we’re tortured with scenes of the Shannons’ middle daughter making lovely eyes with the oh-so cute security guard. Speaking of security, Jim Shannon saved Taylor’s life in the pilot, earning him a job as the colony’s cop, so why isn’t he wearing a uniform like the other security personnel? Here are some other episode plots, in “What Remains” the main cast gets stricken with a virus that causes amnesia. Actually it was better than it sounds, like a dull episode of Star Trek: Enterprise that recycled that plot from older Trek shows. That’s because of the interactions between O’Mara and Conn (who happens to be the only one who can cure the disease: “roll eyes now”). “Bylaw” concerned THE FIRST MURDER EVER COMMITTED ON TERRA NOVA! Wow with all the problems with the Sixers it’s hard to believe that there hasn’t been any violent incidents and casualties before this episode. And if memory recalls, Taylor was nearly assassinated in the pilot. So why no brouhaha over that? BTW the mystery was dull and by the book. A recent episode “Nightfall” was fairly good (an EMP from an exploding meteor knocks out the colony’s electronics leaving them defenseless) then again there were some head-scratching moments. For instance, they go on about how their weapons are now useless, well don’t they have the skills to at least make crude spears and traps? And another thing they have to manufacture chips to operate most of Terra Nova which is without any means of protection. So why is priority given to make a chip just to operate a bio bed for one patient? What about the security of the entire colony? Wouldn’t that take precedent? Terra Nova has some interesting nuggets. Unfortunately TPTB don’t concentrate on them. Yet there is enough going on to keep my attention and watching, which may be for naught. All thirteen episodes in this season are in the can, so there is little that can be done to improve the show at this point until filming the second season. But I get the feeling this one may be extinct before long.